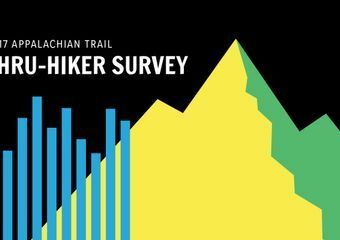 We surveyed 253 section and thru-hikers who were on the Appalachian Trail (AT) in 2017. We asked about the temperature, fill, brands, and models of the sleeping bags and hammock quilt systems they used. Several of our findings were consistent with our data from 2015 and 2016, but we looked at our data over time and noticed a new trend that’s becoming more popular each year. For the details, keep reading—otherwise skip to the TL;DR at the end. Sleeping bags typically come with one of three fill types: natural down, synthetic, or treated natural down (e.g. Dri-Down). Natural down weighs less than synthetic fill, but you have to be more careful to keep it dry. Alternatively, treated natural down is both lightweight and more water resistant, but of course it tends to cost more than untreated natural down or synthetic fill. All three were all fairly popular choices, but natural down was the most common, used by almost half of hikers. A few hikers actually used bags that were synthetic on one side but natural down on the other. The concept for these bags is that they have the water-resistant feature of synthetic fill on the bottom side (which would become damp more easily on the ground), but the warmth and lighter weight of natural down on the top. 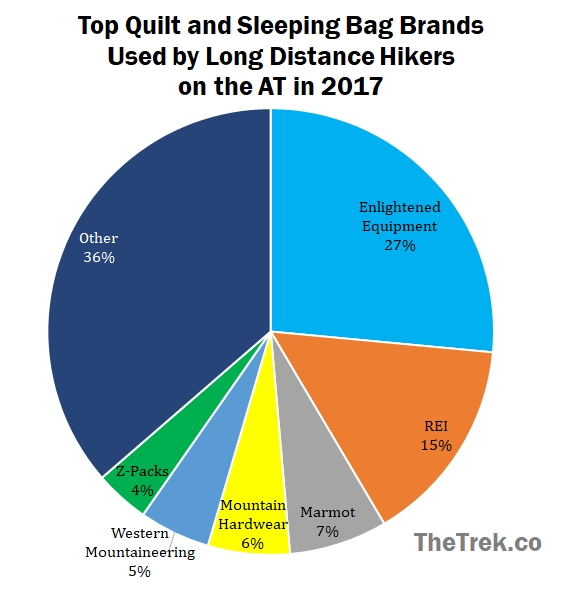 When looking at the preferred type of sleeping bag, most hikers opted for the traditional sleeping bag, but backpacking quilts were also fairly popular, being used by at least one third (33%) of hikers. Quilts have typically been used in conjunction with hammocks, and hammock users were significantly more likely to use quilts than use sleeping bags. 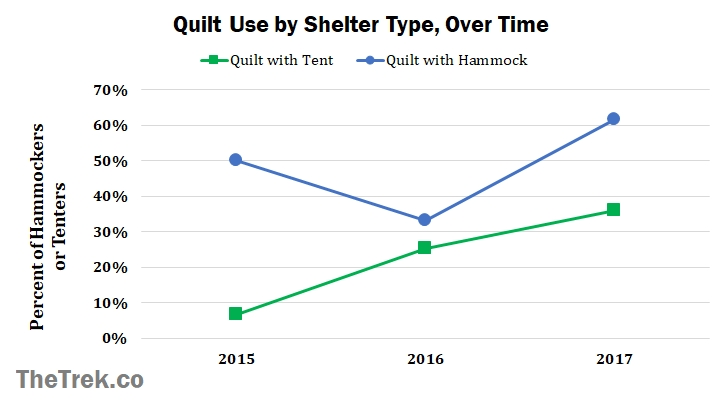 However, once again, we saw an increase in quilt use by traditional tent users, compared to last year and the year before. In 2015, only 17 percent of tent users opted for a quilt instead of a traditional (usually mummy) sleeping bag. By 2016, one quarter of tent users were choosing hammocks, and by 2017, one third of them were. About one third of hikers used more than one sleeping bag during their hike. In past years, they have typically kept the same type of bag (quilt vs. traditional) and the same fill type, so we did not ask follow-up questions about that, this year. Changes are usually on the level of choosing different models, or seasonal changes to bags of different temperature ratings. We asked hikers the temperature rating of the bag (or quilt) they started out using and the lowest temperature they endured with that bag. We asked the same questions about the final bag they used. Because the optimal temperature ratings are expected to change by season, I broke these numbers down for northbound thru-hikers and southbound thru-hikers. Unfortunately, we don’t have enough data on flip-floppers of each direction to give good averages for these. For Northbounders, the median lowest temperature endured was 20 degrees Farenheit (°F), and Northbounders’ first bags had a median temperature rating of 20 F. Their final bags had a median temperature rating of 35° F, although the median lowest temperature they endured was slightly higher (40° F). Keep in mind that this could change a great deal from year to year, and by start date. A quarter of Northbounders endured a lowest temperature that was between -27° F and 10° F, so hikers who begin earlier in the year should probably use sleeping bags with temperature ratings of 10° F or lower; an overnight low of -27° is highly unusual for an AT thru-hike so a rating of 10° F should be sufficient, even for earlier start dates. Although I don’t have any data on this, a typical rule of thumb I have heard is that Northbounders who start their hikes in March or earlier can switch to summer bags in mid-Virginia or Harpers Ferry, whereas hikers who start in mid-April or later can switch to summer bags in Damascus, Virginia (right over the Tennessee/Virginia border). Again, this is anecdotal and I don’t have data on the best place to switch bags. 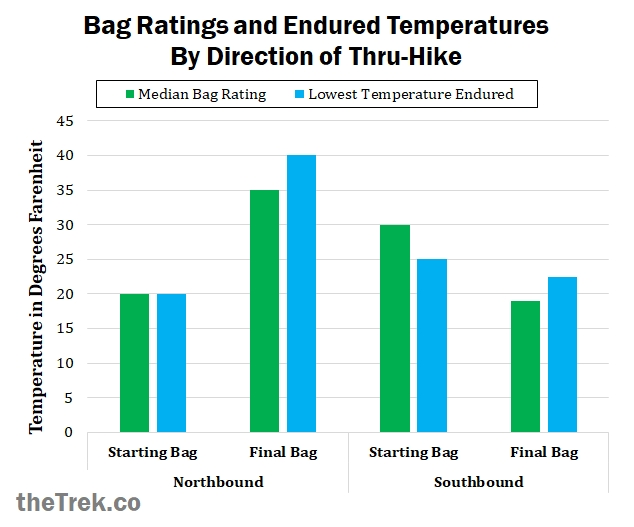 For southbounders, the median lowest temperature they endured was 22.5° F towards the end of their hikes, and the final bags they used had a median temperature of 19° F. Southbounders’ first bags had a median temperature rating of 30° F, but the lowest temperature they endured with these bags was 25° F. Hikers who sleep cold or use a sleeping bag liner should be fine with a bag that’s only rated a few degrees higher than the nighttime low, but based on this data, I would generally recommend that Southbounders use a sleeping bag with a rating of 25° F from the start. Keep in mind that 25° F is the median temperature Southbounder’s endured. The lowest temperature they reported at the start was zero° F.
We asked hikers what their favorite bag or quilt was that they used on the Appalachian Trail in 2017. 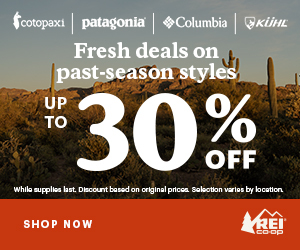 For traditional sleeping bags, the most popular brand was REI, followed by Marmot, Mountain Hardware, and Western Mountaineering. For quilts, the most popular brand was Enlightened Equipment. In the past, we’ve seen more variety in hammock brands and models, but this year, no other models were used by more than 2 people. 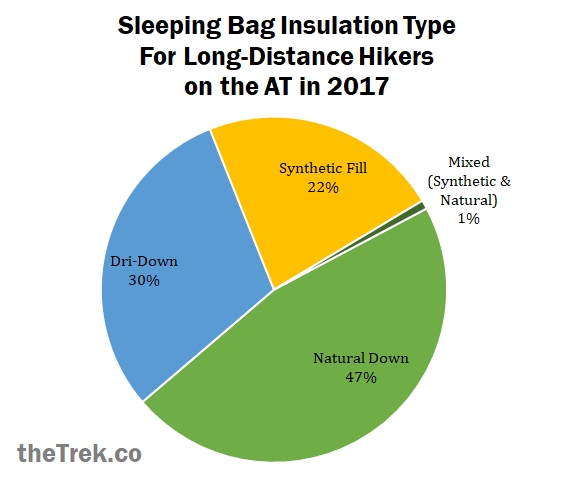 Synthetic, natural down, and treated down bags are all common choices among long-distance hikers on the AT, with down bags being the most common. The majority of long-distance hikers continue to use the traditional sleeping bag, even among those with non-traditional shelters. However, we’ve seen a trend over time, where quilt systems have increased in popularity among tent users. For northbounders, a temperature rating of 20° F is probably sufficient for the typical thru-hiker. Those starting early (or earlier than “The Bubble”) should consider ratings as low as about 10 °F. Northbounders who replace their bags seasonally should be fine, on average, with summer bags rated at 35° F.
For southbounders, a bag rated 20 °F is likely sufficient for finishing before the end of October. Last year, we only collected data through October (not November). This year, I can confirm that 20° F is about right, even for November finishes. 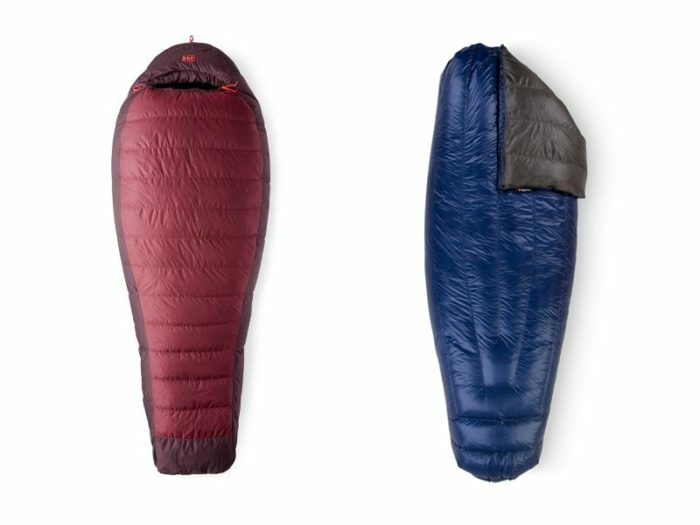 The most popular sleeping bags were several models by REI. 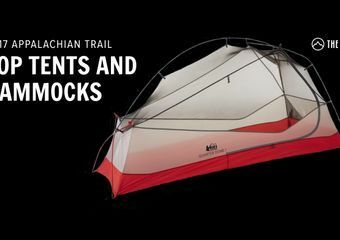 By far the most popular quilts this year were by Enlightened Equipment, with their Revelation quilt being used by 1 in 5 hikers who took the survey. Congratulations to all hikers who completed the entire AT or a section in 2017! Many thanks to those who participated in the survey. Thanks also to Zach Davis and Maggie Slepian for their comments and for distributing the survey. Check out my earlier post on general hiker information. For the upcoming gear survey posts, subscribe to the Trek Newsletter. One that should be included is ZPacks, which is a quilt/bag hybrid. I am prepping for my AT NOBO Thru and looking for a new sleeping bag. 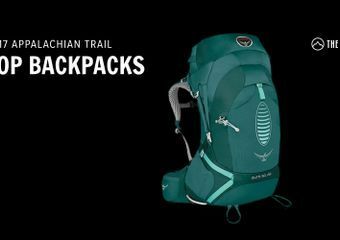 I think I narrowed it down to the REI Igneo (which you included) and the ZPacks Full Zip or Classic. They also have a quilt version. If you look at the pie chart, zpacks is on there. The accompanying graph makes it look more like 7%. Am I missing something, or which is right? Thanks.